Current Alternative Funds in the U.S.
During the Vietnam War, a number of U.S. peace activists began to look for alternatives to paying taxes for war. Joining the small core groups of pacifist war tax resisters, they became unwilling to pay for war just as they were personally unwilling to fight. As significant numbers of people began to refuse payment, resisters founded the first alternative funds to hold and redirect resisted taxes. The purpose of the alternative funds was, and continues to be, the redirection of tax money from war and war preparation to the funding of social needs and nonviolent social change. This guide is intended to be helpful to folks wanting to start an alternative fund, but this is not legal advice. The information, some coming from the experience of alternative funds 25 years ago or more, may not be complete or relevant to your particular situation. If your experience differs from what’s written here, let us know about it! Carolyn Stevens is a former Coordinator for the National War Tax Resistance Coordinating Committee. She lives in Seattle and was active with the Nonviolent Action Community of Cascadia (NACC), which used to run the Conscience and Military Tax Campaign (CMTC) alternative fund. This article has been updated periodically by NWTRCC. Steven Funk receives a Northern California People’s Life Fund grant for Veteran Artists to #popthebubble — 2016 Granting Ceremony at Berkeley Fellowship of Unitarian Universalists. Through the pooling of resisted tax dollars, they enable war tax resisters to make grants and loans that significantly benefit the work of positive social change and human service in local communities. They provide a focus of activity and support for war tax resisters and help to publicize the concepts of war tax resistance and redirection. They demonstrate that war tax resistance is motivated by opposition to war and not by personal gain for resisters. They embody the idea that citizens can take direct action to redress the misguided and immoral spending priorities of the U.S. government. There are two basic types of alternative fund, but individual funds may differ from these types. Check directly with your local fund to see who deposits with them, how they are structured, and what they do with income that may be generated by the fund. Escrow funds*. These funds receive resisted taxes and hold them in escrow. Depositors can retrieve their money if necessary, especially if they are subject to an IRS seizure. In effect, these funds provide resisters with a form of self-insurance; if, for example, the IRS levies a bank account, a resister can replace the funds by withdrawing money from the escrow account. Interest earned on escrow account funds is granted to community groups. Redirection funds. This type of fund serves as a channel for the outright donation of resisted taxes. War tax resisters pool their resisted tax dollars together and then decide how to grant or loan the funds. Any interest accrued is also donated. * A note about “escrow”: Legally established escrow accounts require certain conditions to be met before funds are released, such as a rent strike, where rent from tenants is held by a third party until certain improvements in the building are made by the landlord. 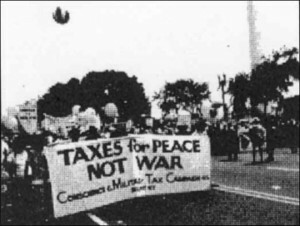 In 1980, the Conscience and Military Tax Campaign fund was established specifically to hold funds in escrow pending passage into law of the U.S. Peace Tax Fund Bill. However, over the years the war tax resistance network has used the term “escrow” more informally; a third party holds the funds but the conditions are set more on an individual than group basis. Some alternative funds combine escrow and redirection aspects, holding some funds in escrow and donating others in accordance with the instructions of their depositors. The bookkeeping and investment practices of the smaller funds are usually straightforward and informal, while large funds, those with tens or hundreds of thousands of dollars in assets, may have fairly complex policies and procedures. New York City People’s Life Fund grant recipients, 2016. Photo by Ed Hedemann. Every year thousands of resisted tax dollars are redirected through alternative funds to support humane and peaceful causes. Usually funds are granted publicly on Tax Day, providing an opportunity to make the links between military spending and the domestic economy. As a way to build coalitions, some funds have begun to invite representatives of community groups to join their boards and help disburse the money. Over their forty years or more of activity, the alternative funds in this country have redirected millions of dollars in resisted taxes and interest on funds held in escrow. More and more groups and individuals decide on their redirection choices annually and may pool their funds together each year rather than setting up a bank account and managing an ongoing fund. This article was originally written in 1993 and this particular fund is no longer active, but their founding steps are still useful. Currently war tax resisters in Portland, Oregon, pool their resisted tax dollars annually and make their redirection choices together. 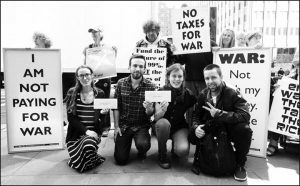 The Oregon Community Peace Fund (OCPF), which began receiving money on Tax Day 1993, was an outgrowth of the Oregon Community for War Tax Resistance/War Resisters League (OCWTRC/WRL). OCWTR located in Portland, formed in response to the Gulf War – bringing together both long-time war tax resisters and new comers alike. Like other alternative funds, it provided a vehicle to redirect our registered war taxes from militarism to local human needs within the community. It was more than a year from conception to operation of the fund. Throughout much of this time we struggled with the pros and cons of whether a non-profit status would be helpful (or harmful). In the beginning, we were offered the opportunity to be umbrella-ed under a number of other organizations. However when the local Fellowship of Reconciliation (F.O.R) got the OK from the national F.O.R for OCWTR (and the fund) to become one of their projects, the national had concerns we could jeopardize their non-profit status. It was suggested that we be educational rather than avocational. After much soul searching, we decided that this was not acceptable, and we were probably better off without the non-profit status. Two OCWTR members, both with jobs and other activist commitments, were responsible for the grunt work of drafting by-laws organizational procedures, forms to be used in operation, and a brochure, to be used in promoting the fund. The entire group reviewed all of the draft material and helped to finalize all aspects of the Fund. The Fund accepts non-refundable contributions, refundable resisted war taxes, and loans. Its purpose is to maximize the redirection of money into the community, while at the same time retain an adequate amount of money in the escrow account to refund war tax resisters if needed. It was determined that loans would be made from the contributions and deposits, and grants would be made from the interest. There was some concern regarding whether to include loans and how much, due to the risk of an organization defaulting on its repayment. However, we all seemed to feel it well worth the risk. It was decided that contributions and deposits would be used as follows: 1) a minimum of 20% will always be kept in escrow (at a local credit union; 2) as much as 40% will be used as interest-free loans to support organizations providing basic human services, especially those promoting education aimed at social, economic, or political change; and 3) as much as 40% will be socially responsibly invested. It was further decided that interest would be distributed such that; 1) 10-25% will go toward operating expenses of the Fund; 2) 65-80% will be given out as grants, based on a similar selection criteria as the loans, but to more needy organizations, and 3) 10% of the interest will support other war tax resistance efforts. Following is a step-by-step method of how we started and operate our Fund. We drew heavily on the experience of others, including the Alternative Fund Packet. As tedious as this was, it provided the organizational framework for the fund. The by-laws helped us to clarify the purposes of the fund, and how it would be run. For example, our Fund is supervised by a Board of Directors of six local people. To serve on the Board, a person must be committed to struggle against violence and militarism, and either is engaged in or supporting some form of conscientious war tax resistance. The Board is required to meet quarterly to sort out loans/grants, etc. Since we are now only a few months old and we are still publicizing the Funds and soliciting loan applications, we look forward to our first distributions of funds. This was the “nitty-gritty” of the Fund’s operations. The organizational operating produces helped us to decide questions such as: Will the Fund be an escrow account only? A loan fund? How much will be loaned? It discussed all the day-today bookkeeping concerns, publicizing the fund, and required forms. We chose to use a credit union, because the money kept in escrow would be primarily reinvested in the local community. However, most often we found that the base of membership for the local credit union was particular employer groups. We really had to search to find a credit union which would accept us an organization. We did not want to use a bank, because their investment policies are more questionable and very difficult to track. It was helpful to have the involvement of a bookkeeper at the point of the designing our forms (deposit and withdrawal forms, loan and/or grant applications, etc.) and setting up the books. We copied whatever forms we could find that other groups were using, and modified them as we saw fit. The brochure could only be created after most the other work was completed. At the time we were applying for a grant (Which we didn’t get), and needed a finished brochure for enclosure in the grant packet. We pushed ourselves really hard to open the Fund by Tax Day, shortly after the brochure was completed. The opening of the Fund was announced via a radio interview on Tax Day. We are planning to do additional publicity in the future via radio, newspapers, coffee houses, etc. OCWTR will be sponsoring a cajun dance to publicize the Fund and to demonstrate that conscientious objection, although serious, can be fun. Originally written in 1993 by Lynn Weiss, a member of the New England War Tax Resistance. This article has been updated periodically by NWTRCC. Once refused taxes or other monies are deposited with an alternative fund, what happens to them? Most alternative funds provide grants and loans to community development and peace, justice, and social change projects. Only a few, however, distribute all their deposits directly to such projects. Most funds first invest the money they collect and distribute the interest or a portion of the deposits. Many tax resisters maintain escrow accounts as a way of protecting money from IRS seizure and clearly designating it as part of a pool of refused or resisted taxes. Some funds also allow members to maintain savings accounts. This money is not necessarily refused taxes but it is protected from seizure and the interest from the money may be given away. Alternative funds are entirely independent, with boards who make their own investment decisions. While they may use banks or credit unions, most fund boards look at local community banks or credit unions and/or use socially responsible criteria in deciding how to invest their money. Not all banks and credit unions are equal, and funds seeking socially responsible financial institutions can consult online sources such as the socially responsible investment pages at greenamerica.org or contact Green America at (800) 584-7336. Several alternative funds use money market funds like Calvert or Pax World, which do not invest in nuclear power or weapons manufacturers. Other alternative funds invest their money by providing long-term, low-interest loans to progressive community groups and businesses or food co-ops, low income housing construction projects, or progressive publications. A source of information on investing in the local community is a growing body of Community Development Financial Institutions (CDFIs). To learn more, look into Opportunity Finance Network in Philadelphia, (215) 923-4754, or these sites: Enterprise Community, and Local Investing, News, Education, and Resources. You might also look into Equity Trust, PO Box 746, Amherst, Massachusetts 01004, (413) 256-6161, which provides loans to farmers from funds loaned to Equity Trust. Most alternative funds invest money in more than one place, both for security and convenience. For example, many socially responsible money market funds limit the number of checks that can be written, so an alternative fund might invest the bulk of its money with a socially responsible fund while maintaining a petty cash account in a local credit union that is convenient to the treasurer. Some alternative funds don’t maintain escrow accounts or collect interest. Instead, they may maintain a no-interest checking account and distribute money directly to groups and organizations working to alleviate injustice or bring about peace. People who reject interest have many reasons for doing so (see The Gift by Lewis Hyde, for an interesting discussion of the negative effects of interest on human society and relationships). 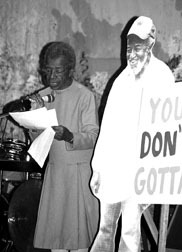 Juanita Nelson (1923-2015) of Pioneer Valley War Tax Resistance (pictured right, with a photo of her late husband Wally Nelson) expressed the views of many who refuse interest when she termed the collection of interest “appropriation of another’s labor,” or more bluntly, “robbery.” Bob Irwin of New England War Tax Resistance, on the other hand, thinks of interest as rent rather than robbery, and argues we should take money from the bankers by earning interest (through socially responsible investment) and redirecting it to good purposes. For Juanita and Bob’s full arguments, see their commentary at nwtrcc.org/war-tax-resistance-resources/readings /whats-your-interest, or ask the NWTRCC office for a copy of the original pamphlet that includes commentary by others. See also Funds That Don’t Have Escrow Accounts or Collect Interest below. 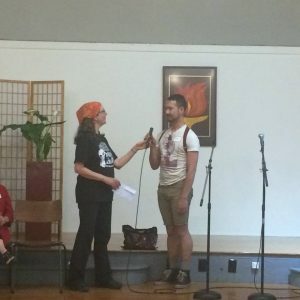 This article is based on one by Frances Schwab of New England War Tax Resistance from the former Alternative Fund Packet, and on information from Jim Tull of Rhode Island, Geov Parrish and Vivien Sharples of the Conscience and Military Tax Campaign, and Dave Ortman of the Northwest Peace Fund. Jerry Chernow of the Southern Wisconsin Alternative Tax Fund writes about their 2005 case, the last time a fund has received an inquiry from the IRS. One of the usual concerns of groups starting alternative funds is whether or not the IRS will impose levies and seize money from the fund. Steve Gulick of Philadelphia War Tax Resistance Alternative Fund says, “Alternative funds are essentially secure from IRS levy simply because of the amount of hassle IRS would have to go through, including the publicity boost such a levy would give war tax resistance.” Part of the “hassle” would be proving that a specific number of dollars in a fund is indeed an “asset” of a particular tax resister, which they would be legally entitled to seize. The IRS is on firmer ground in this respect when they levy and seize from an individual resister’s bank account or paycheck. In the more than 45 years since the first fund was established about six funds have received levy notices, but no money has been seized. In a rare case or two, the fund emptied its account or changed its name to avoid further investigation by the IRS. Over the years about four funds reported interactions with the IRS. The Conscience and Military Tax Campaign Escrow Account (CMTC), while based in Seattle, received a levy notice on an individual depositor in 1986, which they refused to honor. They were taken to federal court and found liable for a penalty of $1,250 (approximately 50% of the amount levied) plus $250 interest. After due consideration, CMTC decided not to voluntarily comply with the judgement. Wishing to avoid seizure of records and funds, CMTC placed the $1,500 in a separate account and informed the Justice Department of its whereabouts; if they wanted the money they would have to seize it from there. The money was never seized. The Northwest Peace Fund, a project of the Seattle Mennonite Church, received a levy notice on one of their depositors in 1987. After discussions, the depositor requested a withdrawal from the Fund. The Fund informed the IRS that they were not an employer of the depositor and that the question of withholding taxes is a matter between the citizen and the IRS. The Fund returned the IRS forms and received no further contact. This fund is no longer active. The Rhode Island Alternative Fund (RIAF), established in 1977, had a slightly different issue with the IRS, but one that came about because of their attempt to protect individual resisters from seizure through the Fund. RIAF had filed with the Secretary of State as a nonprofit corporation, essentially to protect individual resisters. This strategy backfired when the IRS, after 6 years, inquired about RIAF’s tax status. The group’s response, ironically, was to apply for tax exempt status, using the help of an accountant who thought they had a decent chance. The application emphasized the group’s educational and charitable missions, but it was turned down because the Fund posed a “burden to the government” by encouraging illegal and harmful activity. So, rather than submit to paying corporate taxes, the members dissolved the RIAF in 1987. The Southern Wisconsin Alternative Tax Fund was set up in Madison in 1984. It maintained an account for a number of depositors for two decades. Then, in about 2005, an IRS agent, whose specialty was apparently hunting out tax shelters, contacted the fund manager. The agent wanted to know about the fund, how it was set up, and to see a list of depositors. After some months of intermittent contact and correspondence, the fund manager did have a personal meeting with the IRS agent and indicated that he would not give over a list of depositors to the IRS. To be on the safe side, the fund granted out all the monies (except for a few small expenses) and closed the account. The group eventually changed the fund name and re-established itself after no further contact from the IRS. Although the future behavior of the IRS is, as always, unpredictable, past history over many years indicates no IRS seizures from alternative funds. Hence, fear of IRS seizures does not appear to be a good and sufficient reason for not starting a fund. Of course, if your fund should receive a levy notice, please report it promptly to NWTRCC. It is likely that you can challenge the levy, avoid seizure from your fund, and gain good publicity for WTR. Over the decades, some alternative funds had loan programs. Although it is not a very active aspect of the groups today, the option to offer loans is worth keeping in mind today. The amounts loaned ranged from $500 to S10,000, with most below $2.000, and alternative funds usually charged no interest. Loans can be done with or without written repayment plans and deadlines, although experience showed have a written document proved useful. Most funds had at least some recipients default on loan repayment. Some chose to use interest on escrow accounts or money from redirection funds to write off defaulted loans when necessary. See the enclosed sample loan forms. Some alternative funds have included the option of providing financial assistance to war tax resisters who are having their assets seized by the IRS. The assistance could be for legal defense or for living expenses. We do not have recent examples of this being available or such active assistance requested. However, there is one national group that exists to help WTRs with the penalties and interest seized from them by the IRS: the War Tax Resisters Penalty Fund (WTRPF). It was begun in 1982 by members and friends of the North Manchester (IN) Fellowship of Reconciliation. They found that IRS interest and penalties kept many people from continuing their war tax resistance, and prevented many more from even considering such a witness. The founders decided to invite sympathetic people to form a broad base that would help sustain and support war tax resisters. They hoped that with hundreds of supporters they could lighten the resisters’ financial burdens and also actively involve larger numbers of people in the war tax resistance movement. Here’s how the Fund works: Persons needing assistance with interest and penalties imposed by the IRS for war tax~ resistance make their requests to the WTRPF committee, which reviews each resister’s claim. (The WTRPF reimburses only interest and penalties already paid to IRS; it does not help with the original lax burden of the resister, nor does the Penalty Fund pay the IRS directly.) Resisters must provide documentation with their requests: a copy of the IRS collection form, and a copy of their original “letter of conscience” to the IRS explaining their refusal to pay. Persons interested in supporting war tax resisters are put on the WTRPF mailing list. Between two and four times a year the committee combines the requests for reimbursement and sends out an appeal to all names on the mailing list. If the requests total $1000, for example, and the Fund has 500 names, they ask each participant to send in $2. Appeals usually range in amount from $2 to $30. To become a member of the WTRPF or to request assistance, contact them at WTRPF, 1036 N. Niles Ave., South Bend, IN 46617 or see www.wtrpf.org. Some funds limit their depositors to those who belong to a specific group, generally a religious body. They may also only redirect the fund money to projects sponsored by their group. Quaker groups around the country established such funds in the 1980s and 1990s. Though less active now, the model is one that can be revived at any time. Following is a description by Ben Richmond of the Friends United Meeting Peace Tax Fund based in Richmond, Indiana. In response to two war tax resisters who were on the staff of our denominational office in 1981, the General Board of Friends United Meeting said, ‘FUM will support those staff persons who conscientiously take a stand against paying war taxes.’ The next year, it established an ‘escrow account set up for conscientious withholders of war taxes’ for the use of staff. In 1984, the fund was opened to members and attenders of Friends Meetings which are ‘members of Friends United Meeting’ and in 1989, the fund was opened to all Friends in the United States. The Fund accepts ‘conditional contributions’ of resisted tax money, which can be returned to the contributor in the event of IRS levy or threat of levy. The income from investment of the Fund, and contributions, which have matured for seven years, is distributed to ‘life affirming causes.’ These have generally been related to our denominational mission work: hurricane relief in Jamaica, a Friends hospital in Kenya, scholarship funds for schools in the West Bank and Belize. This support opened the door for a further expression of support in 1987 in the form of a personnel policy which permits FUM to not withhold the federal withholdings tax of conscientious objectors to military taxation. Throughout the 1980s and to the present, FUM has had one or more tax resisters on staff, and so is in practical non-compliance with the withholding law. Friends United Meeting’s Board has never been united in encouraging war lax resistance. However, tile Board has recognized the integrity of war tax resisters and that this witness has deep roots in Quaker history and our faith. The intent of the Board has therefore been to offer practical support at the corporate level for the individual witness of members of our faith community. 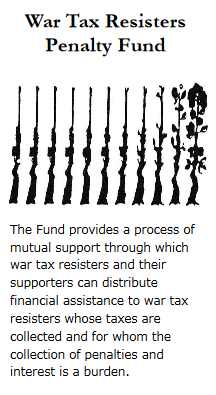 Over the years, nearly all the alternative funds have offered financial support to war tax resistance activities. For most funds, this means small amounts for local activities and some regular support for regional and national work. The money is either budgeted and taken out before grants are made, or is given in the form of grants upon request. Some funds also make grants to special WTR projects such as the Alternative Revenue Service, sponsored for a few years in the early 1990s by the War Resisters League; Building Our Swords into Plowshares, a WTR-initiated housing project in western Massachusetts; and the Death & Taxes introductory video made by NWTRCC in 2010. Most funds, as Affiliates of NWTRCC, pay regular dues to the national organization. Others, such as the Conscience and Military Tax Campaign (CMTC), New York City People’s Life Fund, and New England War Tax Resistance (NE/WTR) have been able to able to pay some compensation to staff who administer the fund or do WTR organizing for their groups. There is some philosophical debate about using alternative fund money to support WTR work. Some war tax resisters believe refused taxes should be used primarily for the work the government should or would be spending money on if its priorities were rearranged; and that money for WTR organizing should be above and beyond our redirected tax dollars. Other see WTR work as “priming the pump” to get more and more dollars diverted from the military to human needs, and as such is an important task for our refused tax money. 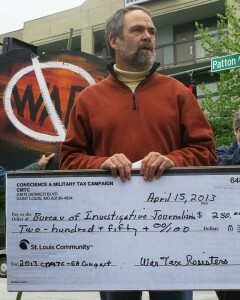 It took our tax resistance group about a year to organize our fund. The most difficult part of this revolved around the question of whether or not the fund should utilize an escrow account. This type of account would enable the fund to return money to resisters when under IRS pressure, while in the interim earning interest for the fund. Most in our group felt that an escrow account fund was something we didn’t want. These are two basic reasons for this feeling, the first being that escrow accounts by their basic nature are dependent on interest and investment capitalism. Investing money in an economy that is heavily dependent on militarism is questionable. Furthermore, escrow accounts with their vitality dependent on profitable investments frequently create a contradiction between investments yielding high returns and investments supporting human needs. In other words, the bank, the money market, the stock market, etc,. probably will return the highest profit on the fund’s investments, but what are these financial institutions doing with this money? Alternative investments such as public housing, education, peace groups, cooperatives, health care, etc., are more attractive but for the most part they don’t pay very high interest. The second objection to escrow funds concerns the type of witness this fund projects. The mechanism of this type of fund seems to reaffirm the power of the IRS on one hand, and demonstrate the feebleness of the tax resister on the other. The escrow fund receives a loan from the resister, but then returns it when the resister is under pressure. The fund has gained some additional money form interest, but the resister often has to pay interest and penalties exceeding the fund’s gain. This demonstration of merry-go-round economics isn’t a very inspiring witness to the outsider. Finally, many of us feel that an escrow fund would contradict the nonviolent Gandhian principles that we hope our tax resistance embraces. While the escrow fund is less risky, offering a substantial measure of safety, it also diminishes the power of nonviolent as it removes the struggle, the individual’s willingness to withstand hardship to produce social change. As our group solidified its feelings about the question of an escrow fund, a few felt that by taking an anti-escrow position we would be moving toward an elitist position. Those feeling this way pointed out that if we closed off our fund to people who might want donated money returned, we would isolate ourselves as purists. They felt that by having escrow availability, and accepting people where they are at, it would be possible to help move these people along to a more radical position. Bill Ramsey represents CMTC at a May 2013 granting ceremony in Asheville, NC. Bill Ramsey is the coordinator of the Conscience and Military Tax Campaign (CMTC) escrow account, now located in North Carolina. I spoke to him in mid-2017 to get a sense of how CMTC operates today, and how its two recent moves have affected operation of this long-time alternative fund. Many of the changes that CMTC has made over the past few years are instructive for folks starting an alternative fund today. Originally the CMTC escrow account was administered from Long Island, New York. In the late 1980s, it moved to Seattle, where it was administered by the Nonviolent Action Community of Cascadia (NACC). In 2010, NACC decided to seek a new host for the account. A St. Louis-based team, including Bill Ramsey, took on the fund in 2011, folding an existing St. Louis alternative fund into CMTC at the same time. The fund moved again to North Carolina in 2012, following Bill Ramsey. Board members are presently from both St. Louis and North Carolina and New York City. CMTC sends one mailing to all depositors each year. The letter includes a list of grants they’ve made, a granting form, and a letter explaining developments in the fund, and the letter reports the balance in each depositor account. Because the fund earns such low interest due to its investments in community development, balances of $200 or less actually *cost* CMTC money (postage, printing for annual letter). They have been encouraging these depositors, who may be telephone tax resisters, or one-time war tax resisters, to donate their deposits to the grant fund. Bill and prior administrators have taken a stipend for the labor of administering the fund. Presently, this labor includes 5-6 financial transactions a month, compiling end-of the year financial reports, handling a small amount of mail, preparing the annual letter to depositors, and administering the annual granting process – averaging a couple hours a week. Bill has stopped taking a stipend for administering the fund recently, saying that in the 1980s, with high interest rates and high granting amounts, it made more sense to pay administration. With lower interest rates, and lower traffic on CMTC accounts, it makes less sense. However, CMTC is looking to pass off administration to a new group in the next couple of years. Bill is wondering if someone with skills in promotion could pick up the fund a bit. Most depositors have come from word of mouth, including referrals from NWTRCC. At this time, CMTC is getting 4-5 new depositors per year at most, with 5-6 people closing their accounts. This puts CMTC at a plateau or slight loss in number of depositors. In addition, keeping in touch with people can be a challenge. Two particular challenges are unreported address changes with no forwarding address, and when people pass away, and don’t let their relatives know that they have money in the fund. The CMTC board is currently four people. They have two board conference calls per year. Meetings include grant application preparation and evaluation, general management of the accounts, investment updates, etc. As a long-term fund with a variety of administrators over the years, some information has gotten lost (and rediscovered) over time. For example, in 2013, CMTC discovered accounts holding $16,000 that was not tied to any depositor. This was made up of interest and donations that had not been granted in past years. CMTC added this money to the funds it granted from 2014 to 2017. CMTC receives tax forms about interest earned on each of the accounts – DIV-9 forms. The IRS has not asked why they’re not paying taxes on that amount, but that situation could change. See Levies on Funds for more on a past legal situation CMTC encountered.